On 12 June 2018 the Court of Justice of the European Union (CJEU) ruled on a question referred from the Dutch court regarding the Louboutin ‘red soles’ trade mark. As we explained in an earlier blog regarding this case, Louboutin registered the red soles of its high heels as a trade mark. The registration was challenged in the Dutch courts by a Dutch high street chain, Van Haren, who had been sued by Louboutin for selling high heeled shoes with red soles. During the proceedings a question arose as to the type of trade mark Louboutin had registered and specifically whether it could be classed as a “shape mark”. The distinction is important because a trade mark cannot be registered if it consists exclusively of a shape which “gives substantial value” to the goods covered by the registration. If Louboutin’s trade mark was found to consist exclusively of a shape giving substantial value to the shoes then its trade mark would be deemed invalid. The Dutch court asked for guidance from the CJEU as to what “shape” means and specifically whether it could include other properties such as colour. The CJEU has ruled that the shape of a product or of part of a product plays a role in creating an outline for colour. However, where the registration of the trade mark does not seek to protect that shape but solely to protect the application of a colour to a specific part of that product, this would not be a “shape mark”. 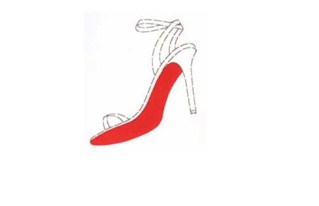 The court found that the main element of Louboutin’s trade mark is the colour red. In light of the fact that the trade mark does not seek to protect the shape of the sole of a shoe but instead the application of the colour to that specific part of the shoe, the CJEU held that Louboutin’s trade mark is not a shape mark. This is in contrast to the advocate general’s view that Louboutin’s trade mark was a shape mark. This will be seen by Louboutin as a significant win. The ruling confirms that Louboutin’s trade mark is not a shape mark and therefore is not invalid on the basis that it does not consist exclusively of a shape. The case will now be passed back to the Dutch court for a final ruling following the CJEU’s clarification of the law.